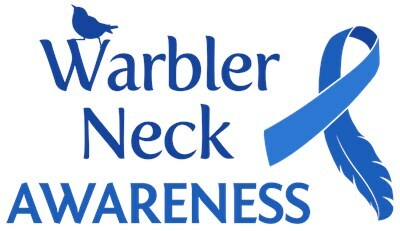 Warbler Neck affects birders each spring season, coinciding with migration and heightened birdwatching activities. This original design features the cerulean blue warbler neck awareness ribbon, which is partially transformed into a feather on one side. Show your support for warbler neck awareness with this original design which also features a warbler (looking up, of course) in silhouette. To order by phone, call toll-free at 1-877-809-1659 from Monday - Saturday 9:00am - 9:00pm EST. You'll need to note the Product Number 030-1265589303 to make your order.